Books, the bodies of reading, were fascinating for me early in life, and I’m fortunate enough to have had parents who, after I left for college, saved many that I had as a kid. The oversized Dinosaur picture book, the scholastic book service biographies I ordered in school, the heroic war stories, the Vonnegut novels. The whole collection fit neatly on shelves built in over my bed. The book shelves of my first apartments were also easily ordered. After a decade and a half in San Francisco, I moved, following a job across the bay that kept me busy for months. But one Saturday morning I woke with the usual to-do-list, which was interrupted by the realization I’d never properly sorted my books. Many simply came out of the boxes, which I’d filled by size and shape, not subject. It was a nice weekend—my recollection is it was blustery outside, but inside I stacked piles of books, moving between bookcases in my living room, kitchen, and bedroom. American fiction, travel guides, a stack for Anne Tyler, movie references, et cetera. I respect the decimal system of Dewey, but my categories are more organic. A History of Eating in America next to a Chinese cookbook; the collected Grantas shared space next to Graham Greene because they fit well. Then I got married, and my books snugged into boxes for two more moves. Once we bought this house, it again became a matter of catch-as-catch-can. I crammed new books into available crannies, meaning whatever organization I had before meeting the missus is utterly dyslexic now. Adding a stairwell from kitchen down to garage meant adding a ground floor mudroom replete with new shelves—they got Nero Wolfe plus most of the books I read between 2012 and 2015. 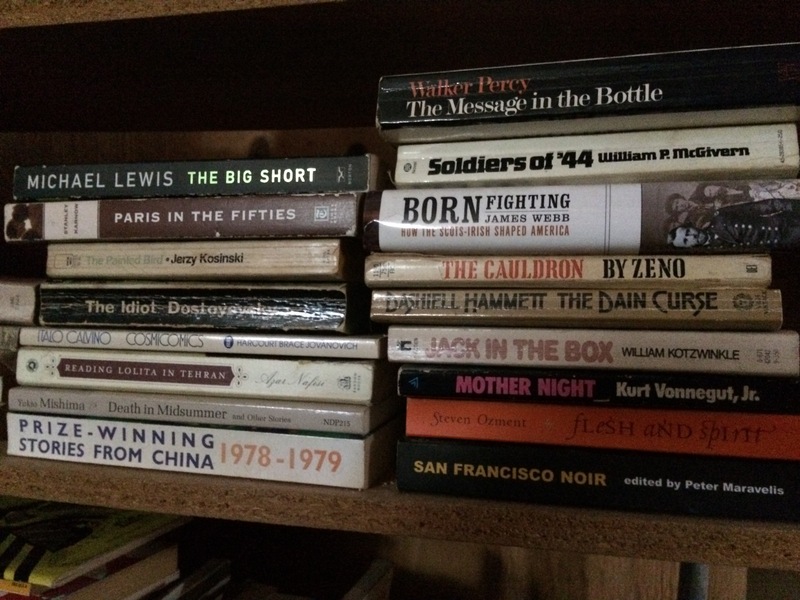 In an effort to lose the war against entropy a bit more slowly, I’m rearranging clusters and sorting books into stacks in my back-of-the-garage furnace- and computer-room grotto, nearly dismayed at how stricken I am with bibliophilia. Am I more chaotic now, or is it that I have that many more books to sort? Complicating matters is Pippi, one of Mrs. O’s two semi-feral cat sisters, who wants to use the stacks as stepping stones, furthering the catty-wampus chaos. I’m allergic to cats, so finding all the little caches of cat fur from her siesta sites doesn’t help. And was it the softness of the paper used in an over-sized reference that led her to use it for sharpening her claws? It all seemed so easy when it fit neatly into shelves over my bed! No matter—I try to keep in mind that I do this for fun. And some part of me is amused to find all those authors from disparate places cheek by jowl next to each other. Your post reminded me of the horrible purge, when we tried to move back in 2007, but did not…we put our books in storage while our place was on the market, and when we brought them back, we had gotten rid of a cheaply (custom) made bookshelf, and the decision was made to downsize into a much smaller bookshelf. We got rid of so many books, it hurts to think about it. It was a mistake, though our house is a bit less cluttered looking now. Ouch, J! When I moved from SF I trucked 7 boxes of books around SF bookstores to sell off what I could. I got good trade-in value from Green Apple out on Clement and one other, but after 4 bookstores a kindly owner told me I could leave them outside his shop if i wanted to just be done with it, and that’s where I left the remnants. Blech, that’s exactly how it is, isn’t it? Whenever we can’t find a book we miss, we think, that stupid purge. I love Green Apple. We lived down the street from there for a couple of years in the early/mid 90s. In the small world category, one of my dad’s best friends has a son who is one of the owners of Green Apple Books. In the not so small world category, I have never met this friend’s son, though I have met my Dad’s friend several times.